First-year relapse rates for drug and alcohol are undeniably high. The National Institute on Drug Abuse (NIDA) reports that relapse rates for substance use disorder are between 40 and 60 percent. One reason for this phenomenon is that outgoing patients have a hard time transitioning back to everyday life once they leave their treatment program. One way to make this transition considerably simpler is by making sure patients have the proper aftercare plans and resources to help them seamlessly transition into post-treatment recovery. It’s important to realize that recovery is a lifelong endeavor and that the process does not end once you or your loved one leaves treatment. The right aftercare can give you the clinical and logistical tools and guidance you need to thrive. Aftercare is the process by which patients endeavor to maintain their recovery as they leave their treatment program and live their everyday lives free from drug or alcohol addiction. It can, by all accounts, be considered the final phase of clinical treatment, and involves the formulation and implementation of a patient-specific plan that effectively addresses their ongoing care needs and lifestyle. 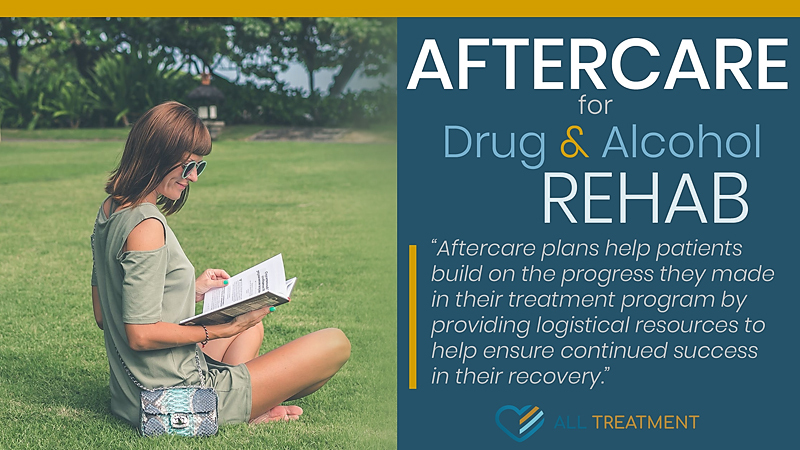 Aftercare plans help patients build on the progress they made in their treatment program by providing logistical resources to help ensure continued success in their recovery. Aftercare plans are developed by patients’ treatment professionals toward the end of their inpatient or outpatient treatment programs, so they can be seamlessly integrated into daily recovery routines. NIDA has designated aftercare for drug and alcohol rehab as a fundamental pillar of the process. Addiction is a chronic medical illness that creates fallout in various areas of a person’s life, from their physical health to their family relationships, careers and overall quality of life. The process provides critical support resources by taking a realistic look at patients’ specific post-treatment needs and helping them avoid the logistical and behavioral stressors that can derail progress and immediately lead to relapse. It’s virtually impossible to maintain recovery without some sort of support mechanism – aftercare programs service those needs. Elements of aftercare can look very different based on each patient’s individual care needs, resources, and lifestyle. Step-Down Treatment Programs – Patients may transition to a less intensive treatment program such as going from inpatient to outpatient. These step-down approaches help ensure patients gradually cultivate the clinical and behavioral resources they need to maintain everyday recovery. Stepping down to a lower-tier treatment program ensures cumulative progress and independence. One-on-One Therapy – Every treatment center will encourage patients to continue their individual counseling with an addiction-trained therapist that is local to them. As important and critical as rehab is, it only begins to address the root causes and sustaining factors of addiction. Continued counseling helps patients continue the work they did with their therapist(s) in their treatment program while facilitating new breakthroughs and progress. 12-Step Programs – Continued attendance at 12-step meetings and support groups are critical to building a network of support and an anchor during the period immediately after treatment. These groups provide a non-judgmental environment where like-minded people can discuss their fears, vulnerabilities, and accomplishments in recovery and develop lasting connections for ongoing guidance, affirmation, and support. Medication-assisted therapy can also be an effective aftercare resource for certain patients eligible for opioid maintenance drugs like buprenorphine, naltrexone, and methadone as well as other drugs to treat ongoing cravings and physical and psychological withdrawal symptoms. The type of aftercare that you or your loved one needs depends on where you are in the treatment and recovery process. Patients who have successfully completed a long-term or inpatient program may choose to attend a less in-depth behavioral care paradigm. Successful graduates of an outpatient program will benefit from an even less hands-on aftercare approach, such as independent counseling or continued self-managed attendance at recovery meetings. Very often, aftercare programs involve abbreviated or no involvement from the personnel at their treatment facility. The trajectory of aftercare is meant to address each patient’s individual care needs and lifestyle after treatment. How Do I Develop an Aftercare Plan? Toward the end stages of a patient’s first phase of treatment, the therapists or intake personnel at their facility will assess their progress and determine what level of intervention is appropriate for them after the completion of their program. Discharge evaluation will include recommendations for aftercare resources. In the cases of court-ordered rehab, facility personnel may work with court officers to ensure patients are maintaining legal compliance with the conditions of their treatment. Other non-clinical types of aftercare can include logistical assistance like rides to work or therapy, assistance finding employment, nutritional counseling, and different kinds of life skills training to help patients gradually increase their independence. There are more resources than ever available to patients who need effective and comprehensive aftercare. Aftercare represents a critical and necessary final phase in the addiction treatment process. It provides patients with the time, assistance, and support they need to get their legs back under them after the traumatic and jarring substance abuse that consumed their lives for so long. It’s unreasonable and naïve to expect yourself or your loved one to tackle recovery immediately after recovery without any means of support. Aftercare for alcohol and drug rehab gives you a bridge to independent and healthy living so you can reclaim every part of your life that has suffered in the wake of your substance use. You don’t have to do this alone anymore.